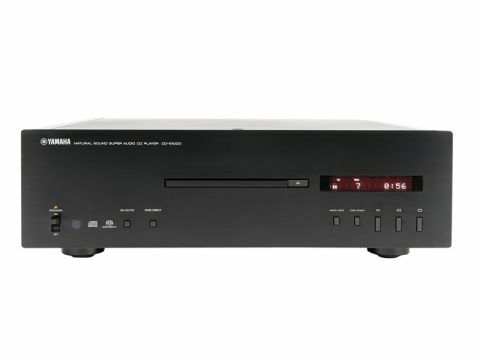 As big, heavy and imposing CD players go, the Yamaha CD-S1000 is one of the biggest, heaviest and most imposing, at least among affordable machines. The front panel's only slightly bigger than most, but the depth of the unit is remarkable and its use of extensive reinforcement in the base makes it quite something to lift. We particularly like the ultra-slim CD tray (which opens and shuts almost noiselessly) and the oh-soretro mains switch. The insides are surprisingly well filled, too. The transport dominates the central one-third of the width, with part of the power supply board behind it, while the mains transformer (a large frame type), sits to the left. At the right is the audio board, another retro job, with through-hole passive components including stand-up resistors and mylar film capacitors, plus surface-mount DAC chips (a pair of Burr-Brown parts) and op-amps. A further board beneath the audio one handles digital signals. With this much real estate, there's a risk that mechanical resonance might colour the sound of a system, including the S1000, but Yamaha has applied quite extensive mechanical damping and the top panel is acoustically quite dead. Performance has clearly not been neglected either – Yamaha proudly extolling the virtues of multiple isolated transformer windings and symmetrical, internally balanced, circuits. Although our listeners paid plenty of compliments to this player, it seems that overall it just didn't quite set them on fire with excitement. It's not entirely consistent in the way it handles different kinds of music, or at least that's how it comes across. For instance, one listener commented on a slightly thin sound on the lead guitar in the Mavericks track, but then went on to comment that the bass is weighty. That would seem to suggest that the upper bass/lower midrange is losing impact, a common enough problem to be sure. The best results were in the Brahms track, (SACD), which had a good, slightly 'dreamy' feel to it and a realistic sense of space, but even this excerpt felt slightly constrained dynamically. Voices project well, both chorally and solo, but a little more connection with the rest of the music-making might be no bad thing. In terms of basic tonality, the CD-S1000 seems to do most things right and its treble is particularly well done, bright when it needs to be, but never unduly forward. If one listens consciously for midrange balance it all seems to be largely in order. But somehow, listening to the music rather than just the sound, one's attention gets focussed unduly on the upper part of the midrange. It's a shame, because many aspects of performance are fine, going on excellent, including deep bass (well extended and defined), detail and imaging.